A few weeks ago, a primary care physician colleague (white man)—who I’ve known for over a decade—sent me the note below by way of our mutual patient’s caregiver (white man) open, not in a secured envelope. In the past nearly 4 years the patient has been under my care, the colleague has not once reached out to me by email, phone, text, tweet, telegraph, or carrier pigeon regarding our patient. He did, however, reach out to my boss (white man) and a hospital executive (white man) a few months ago when the caregiver (reminder, white man) first complained no one in the dialysis unit was listening to him (though the caregiver has never spoken to me directly about his concerns because, I just learned, he found me “intimidating”). 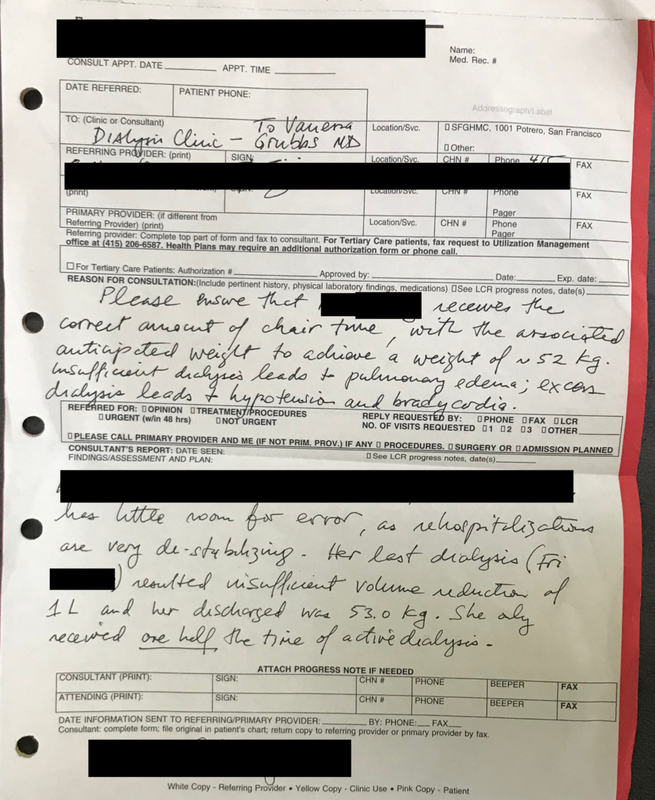 When I suggested to my colleague that he would not have sent this note (that was not accurate physiologically or even as to what actually happened) to me had I been a white man or if the caregiver was not a white man, he said, “I reject that,” for all the reasons, he explained, he could not possibly do such a thing. Ultimately, he did apologize for sending the note, but then went on to explain how there were some kernels of rightness in how he handled the situation. Now, I don’t know if this person’s actions were driven by my race or my gender. I don’t know how to separate the parts of myself to pinpoint exactly what drives someone else’s “ism.” But what I do know is all but me are white, all but me are men, and it doesn’t matter which part of me that allowed my colleague to inappropriately, unprofessionally, disrespectfully engage me. Racism. Sexism. The results for me are still the same, whether he is conscious of it or not. I have felt negativity from my blackness since I was 10 years old, which may have overshadowed my awareness of negativity towards my femaleness. I’ve been followed in stores. I’ve been told by peers and superiors that the only reason I was accepted at prestigious Duke University and Medical School was because I’m a black woman. I’ve been deemed so intimidating that people have gone to my boss rather than directly speaking to me for incidents that others would have had the opportunity to handle themselves. This isn’t new to me or any other black person existing in this society. One could argue that I’ve been fortunate—I have not been the victim of a BBQ Becky, a Delta flight attendant, or a police officer. Yet this incident and others that have happened since, bother me more than they have in the last nearly three decades. 1. To be profiled by a stranger is one thing. To feel like one is being profiled by someone who has known you for more than a decade is another. One would think they could see me through whatever experience they’ve had with me, not by what they carried around in their subconscious. 2. The primary care colleague considers himself progressive, an ally. If an “ally” is unable to even consider, much less accept, that their actions may have been driven by an unconscious bias, then my hopes that we as a society will ever overcome racism are dashed. One doesn’t stand a chance against an enemy if this is the way an ally receives you. 3. This is taking up headspace, attention, energy that non-minorities don’t have to surrender. Headspace, attention, energy that I could be giving to further honing my knowledge in nephrology and to the next scientific research article, research grant, book. One could argue that I shouldn’t be giving my power away in this way. That I should shut all this out and just focus on becoming the person and professional I know myself to be, unrelated to race. I wish I could. Alexandra Garcia was just 20 years old when came to me from the pediatrics nephrology clinic with urine that contained blood I could see only with the help of a microscope and nearly a gram of protein when normal is less than 150 milligrams.